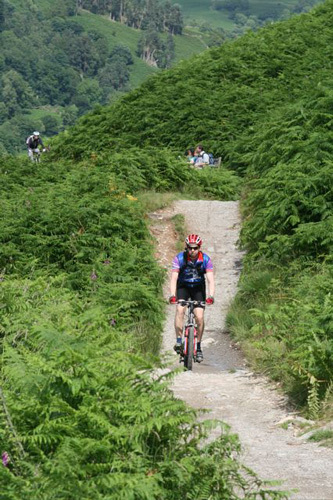 Loughrigg Circuit, Ambleside - Cumbrian Trail Guides - Mountain Bike Cumbria - beautiful trails and information from throughout the Lake District and beyond! 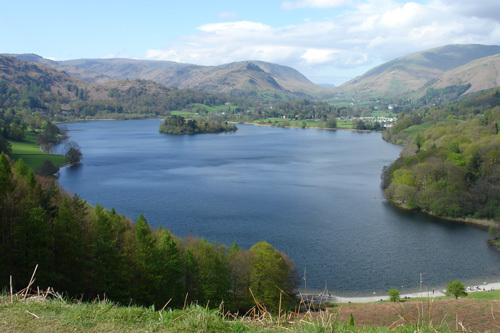 Short and sweet - the circuit of Loughrigg. Here's an interesting trail that's great for a summer evening. The route is described in a clockwise direction. Start from the small car park near Pelter Bridge in Rydal, about a mile north from Ambleside. 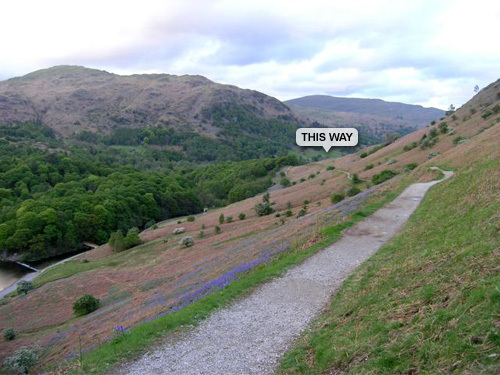 Leave the car park and turn south and follow the minor road alongside the the river Rawthey almost back to Ambleside. A bridleway on the right, leads steeply up the fellside. This is tarmaced to start with but becomes stoney further up. Follow this up through a couple of gates until it comes out on Loughrigg fell. Shortly after gaining the fell, the track becomes narrower and drops down to cross a small beck. 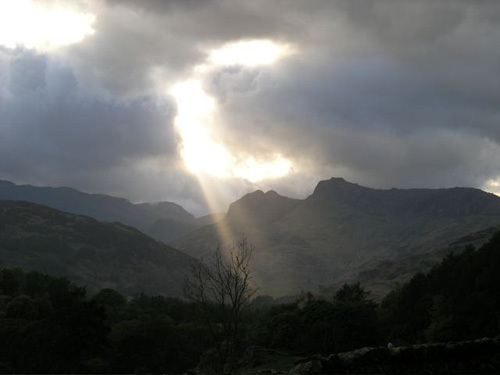 It then drops down again fairly gently towards the Langdale valley. A short technical section ends this descent which comes out by some cottages. 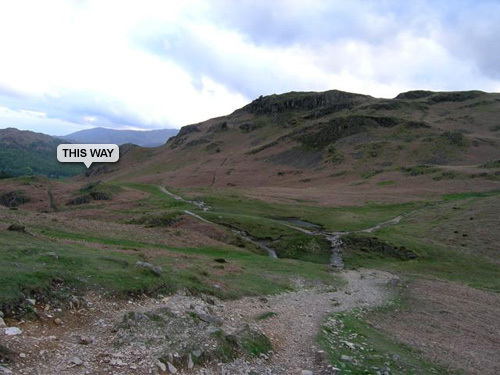 Turn immediately right, almost back on yourself and follow the fenced track that contours around Loughrigg Tarn. At the end, rejoin the road and follow this to the top of Red Bank. 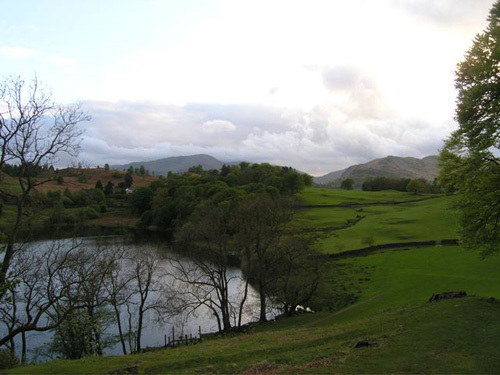 A gate on the right leads into woodland and then out onto the northern flank of Loughrigg, overlooking Grasmere. 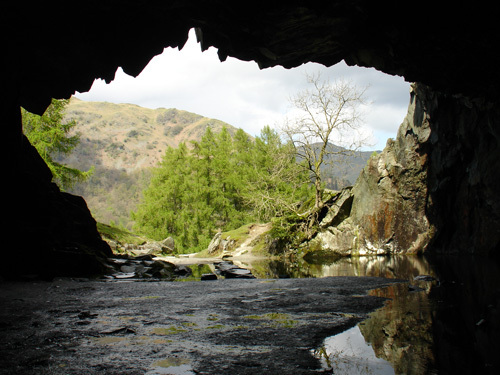 This is the start of Loughrigg terrace, a long swooping descent with only a few obstacles to disturb your passage. 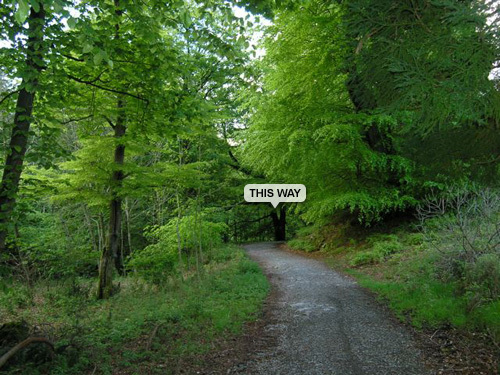 When you reach an obvious corner, keep to the upper path and follow this along above Rydal Water to Rydal caves. These are now fenced off as being potentially dangerous but are still with a few minutes to explore. From the caves, the path drops down again, rejoining the road for the final few hundred meters back to the car park. This is only a short trail, it takes just an hour but you do have to get the timing right. Don't bother going at the weekend. There will be just too many pedestrians around. 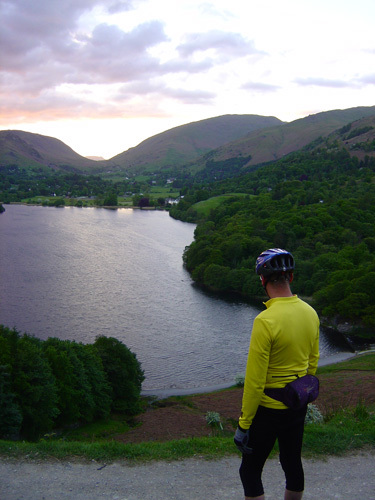 Save it for a nice summer evening, then you'll have the descents, particularly that fine one down Loughrigg Terrace all to yourself. Whilst visiting the area for a few days, my wife and I decided to try this route out. We wanted something short just to finish off a days exploring and it was my wife's first time on a trail like this. The first section was a little off putting as it is very steep but the views and the single track on the way back down is well worth it. We printed out the instructions and they were easy to follow. 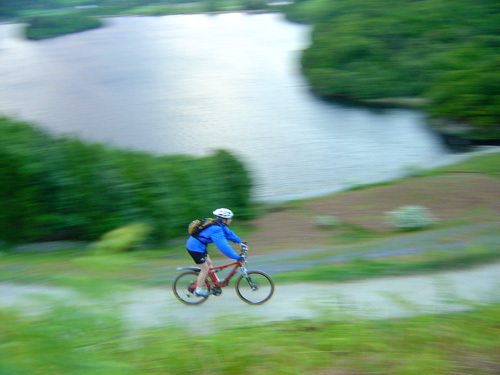 Watch out for walkers though, mainly along the down hill section along Loughrigg terrace. There was only one place on the whole route that I needed to dismount. There was a steep drop off I wasn't prepared for just before Rydal caves and I wasn't carrying enough speed to take off flat and clear the rocks. My wife enjoyed the ride even though had to walk the bike over some of the more technical sections. Overall a great route with a little of everything. Love this ride, but in the other direction. The decent back into Ambleside is always over too quick, but it's just so much fun, and a great way for the ride to end! Hi - great little circuit, but very very popular with walkers, strongly reccomend an early start (6 ish)particuarly in the summer. The mist on Rydal water can be stunning. I took my wife who is still a novice rider. She found the first climb pretty testing but after that really enjoyed it. The ride was a little short for my liking but for a 6miler, I couldn't complain too much. The scenery is fantastic, the 1st climb gets the legs pumping, the down hill is fast, flowy and even slightly tricky in parts. It's got a bit of everything. This trail has been viewed 50209 times!